One of the popular professional football players is named as Marcus Rashford who plays for Manchester United and England National Team. He is a well-known celebrity. He is famous for contribution to professional life. He is best at Forwarding position. Currently, he is playing for Manchester United. He had played for Fletcher Moss Rangers. His Shirt number is 10. He is very talented and skilled player. Passionate and enthusiastic player, Rashford was born on 31st October 1997. He was born and raised in Wythenshawe, Manchester, city of England. 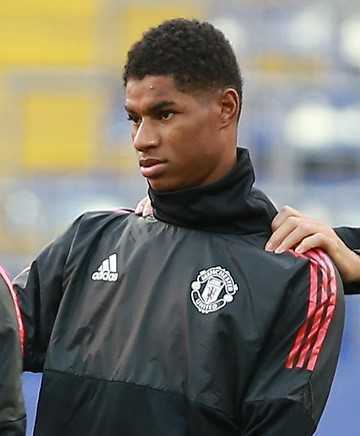 He is the son of Robert Rashford and Melanie Rashford, his father and mother. His nationality is English. His astrological sign is Scorpio. At the small age, he began his career with football. He has got a great personality. Talking about his body, his height is 1.80 m. His weight is of 70 Kg. He has a balanced body with good health. He has an attractive body figure. His smiling face and charming personality have helped him to gain the attention of all the viewers. Marcus played in the youth academy at Manchester United for 10 years. Since 2015, he then started his professional career in football, after he was promoted to the first team of the club. He was also named on the first-team bench for the first time on 21 November for a Premier League match against Watford. He made his first-team debut with two goals against Midtjylland in the UEFA Europa League round of 32, on 25th February 2016. His Premier League debut came on 28 February 2016 against Arsenal in which he scored two goals and an assist. He scored the only goal in the Manchester derby, his team's first away league win over Manchester City since 2012. Rashford signed a new contract with United, keeping him at the club until 2020 on 30th May 2016. He scored his first goal of the season 2016 on 27th August 2016. Rashford scored both goals in a 2-1 win over rivals Liverpool on his first Premier League start of the year 2018 on 10th March 2018. Altogether, he has made over 56 appearances and 13 goals for this club. Marcus had represented himself in his national country, England in both senior as well as junior levels in many tournaments. On 27th May 2016, he made his senior international debut for his side against Australia and scored a goal becoming the youngest Englishman to score on his international debut. He scored his very first competitive goal for the senior team on 4 September 2017, against Slovakia in 2018 FIFA World Cup qualification. Marcus is single. He is not married yet but he is in a relationship with Lucia Loi, his girlfriend. They seem to be very happy with each other. The couple makes public appearances together often. There is no any sign of Separation between them. They are living peacefully. This excellent player makes good money from his work. The net worth of Marcus is estimated to have $85 million in 2018. He is receiving a weekly salary of £20,000 from his present club. He is satisfied with his earning.